The Andalusian Tile Quilt is finally finished. I’m really thrilled with it. It never ceases to amaze me how different a quilt looks once the binding is on. I didn’t go with any of the fabrics I showed you . When I auditioned them next to the quilt they just didn’t do anything for me. Instead I used this Kaffe paper fan fabric in teal colourway and I’m really happy with it. So, do you want to se the finished article? No? Oh OK. See you later… Just teasing. Here it is. This quilt was the third quilt I started. I designed it and made the templates myself. There was no planning. The completed design was totally organic. I hand-pieced all those curved pieces and when I thought I had enough then I appliqued it onto a border of the same fabric as the white tiles. Then I squared it up and did some maths to work out how many triangles I could put around the edge. A little fudging was required on the shorter sides but I don’t think you can tell. Then I decided it wasn’t big enough or looking finished enough and so I put the rectangles around it. I hand quilted it all and then decided that there wasn’t quite enough quilting and so tripled the amount of quilting that was on it. That’s why it’s taken two years. Here’s what it looks like on the back. If you click on the photo you’ll get a larger version and you’ll be able to see that I quilted the coloured tiles with coloured thread and the white ones with white. 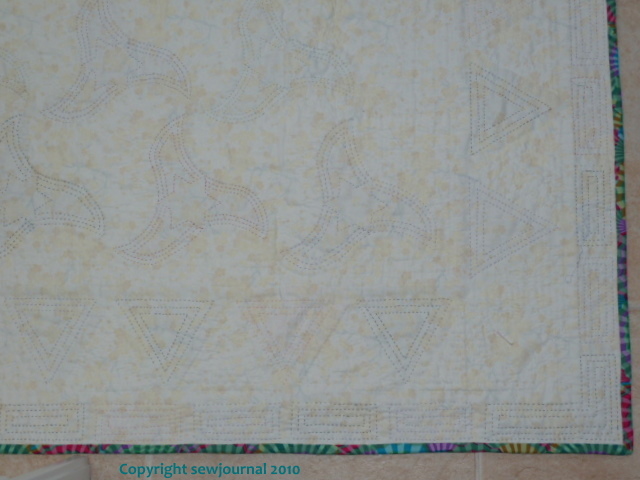 I’m going to enter this quilt in the Bloggers’ Quilt Festival – wish me luck! You can see all the other beautiful entries by clicking on the button below. You did a fantastic job! 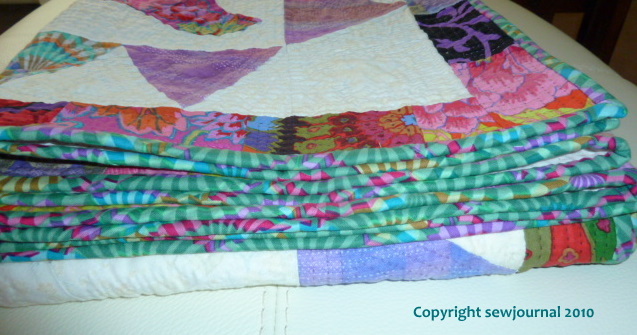 You were so brave to take things apart and try something else till it worked too…Your choice of binding is nice bright finish to the quilt and I like the rectangles you added to help the eye stop…all in all….Ya done good!!!! Thanks Shelley. I’m glad you like it too. You have earned the Gold Medal for PERSEVERANCE !!! It must feel soooo very good to have this beauty finally done. Thanks Joanne. It does feel good to have finished it and to be able to use it finally. Well worth the effort. So satisfying to have put in all that work and have got such a good result! Beautiful beautiful and the quilting is so great too. You have a natural talent! Doesn’t it look fantastic! I really like it, and yes, adding binding really does finish a quilt, even though it’s a tiny amount of colour. I guess the eye needs a frame? i love the bright colors and the bold design. what a beautiful finish! i love your binding choice, too! 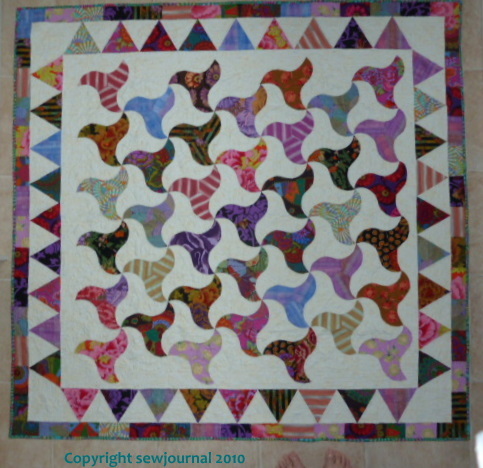 Wonderful use of color and I agree that the bright binding just finished off the quilt, framed it. Good job.